Disgraced financier Bernard Madoff will remain in prison until he is sentenced in one of the largest financial frauds in history. The 2nd U.S. Circuit Court of Appeals on Friday backed a lower court ruling a day after hearing arguments from a lawyer for the 70-year-old former Nasdaq chairman who sought Madoff's release from jail. The government argued against freeing him. The appeals court said U.S. District Judge Denny Chin was correct when he sent Madoff to prison last week immediately after Madoff confessed that he had defrauded thousands of investors of billions of dollars for at least two decades. Investors who had trusted him were outraged that until then, Madoff had been confined to his penthouse apartment since his December arrest. Chin had cited Madoff's age and said the possibility of life in prison heightened his incentive to flee. Madoff faces up to 150 years in prison at sentencing, scheduled for June 16. "The defendant's age and his exposure to imprisonment are undisputed, and the court did not err in inferring an incentive to flee from these facts," the three-judge panel wrote. "Moreover, the district court's finding that the defendant has the means  and therefore the ability  to flee are not clear error. The defendant has argued that all of his assets are accounted for and are inaccessible to him; however, the district court was not required to treat this defendant's financial representations as reliable," the judges said in the four-page ruling. The court noted that Madoff has a residence abroad and "had had ample opportunity over a long period of time to secret substantial resources outside the country." The court appeared to agree with an argument Assistant U.S. Attorney Marc Litt had made in January, when he tried to have Madoff imprisoned before his guilty plea by saying he posed a danger to the community because of the harm he could cause financially. Litt did not press that argument before the appeals court on Wednesday, but the panel of judges raised it anyway in its decision. "We note that there was substantial evidence in the record to support a finding by the district court that bail should be denied to the defendant because he had failed to prove by clear and convincing evidence that he does `not ... pose a danger to the (pecuniary) safety of any other person or the community if released,"' they wrote. Ira Sorkin, Madoff's lawyer, declined to discuss whether he might appeal the issue further. "We are disappointed," Sorkin said. "We respectfully disagree with the court but the court has ruled." Janice Oh, a spokeswoman for prosecutors, said the office had no comment. 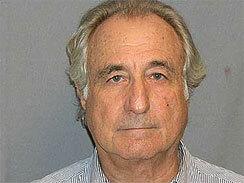 Madoff pleaded guilty last week to securities fraud, perjury and other charges. Until his plea, Madoff had been under house arrest on $10 million bail, confined to his $7 million penthouse apartment in midtown Manhattan. Madoff notified 4,800 clients of his investment advisory business in November that they held nearly $65 billion in their accounts. Investigators say they have located only about $1 billion and believe investors entrusted Madoff with less than $20 billion. They say it is likely that the higher numbers were the result of Madoff adding fictitious profits over several decades. The appeals court noted in its decision that a defendant who has been convicted no longer has the same constitutional right to bail that exists when there is a presumption of innocence. A conviction puts the burden on a defendant to show by clear and convincing evidence that he will not flee or pose a danger to the safety of others or the community. On Wednesday, Madoff's longtime accountant, David Friehling, was arrested on fraud charges for allegedly failing to make the basic auditing checks that would have exposed the epic fraud. "This legal standard doesn't just spell trouble for Friehling. It also ought to make many other Madoff men and women, instruments to the crime, quake in their Guccis," said CBS News legal analyst Andrew Cohen.